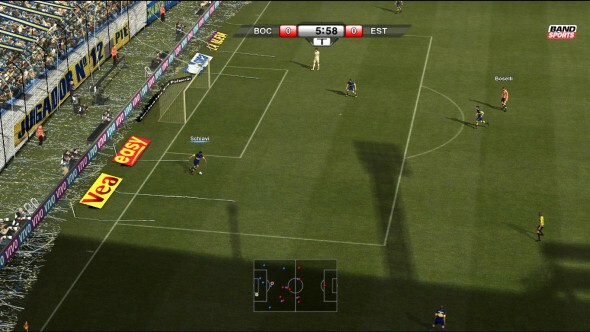 For quite a long time, the Pro Evolution Soccer games haven’t been the most popular in the football (or soccer for the Americans) genre as Fifa usually takes the spotlight. With the newest addition to the series, Pro Evolution Soccer 2015 regains its former glory by having a very well done AI that will make players want to improve themselves and let them try their best in order to get their hands on the trophy. Well, like you would probably expect, a game about football doesn’t have a story. This is the same in this game much like any other. The only kind of story that might be present would be the player leading their favorite team to the trophy. 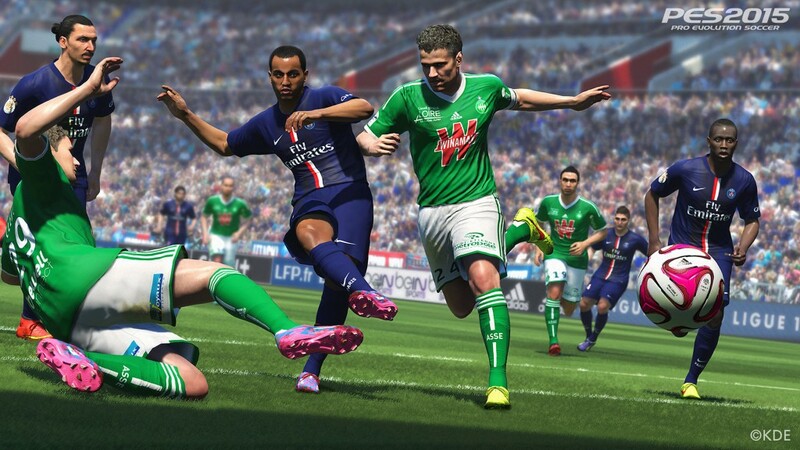 The graphics in Pro Evolution Soccer 2015 are very realistically made, which is good for every football game. The team members are made to look like the real people themselves, but sometimes do not totally fit the bill. The matches are done in very good detail, so it’ll often look very similar to the real thing. The menus also look very slick and nice, much like you would search for television programs on your television but don’t really impress players. All in all there aren’t really bad things to say about the game in this aspect. Like you would think, as it is pretty much the same in every football game that is being released, the music in this game also consist of various songs from various artists well known. 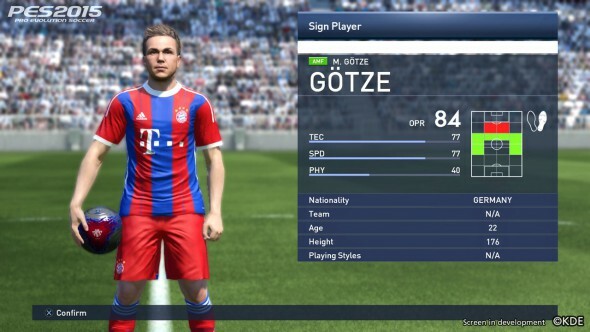 They usually come from the year the game is made, and it is the same in PES 2015. It’s always nice to have some good soundtrack while playing, making you feel much at home. This goes really well with football games, including this one. When playing in a match, a commentator is also giving some comments on how the match is going. However, after a bit of playing you’ll notice that they are repeating the same thing over and over again . 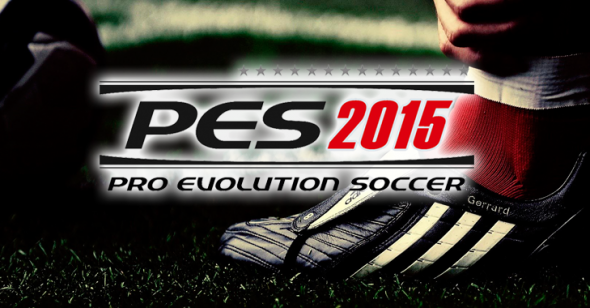 People tend to buy Fifa over PES, as the more recent PES games haven’t really been that impressive and popular. 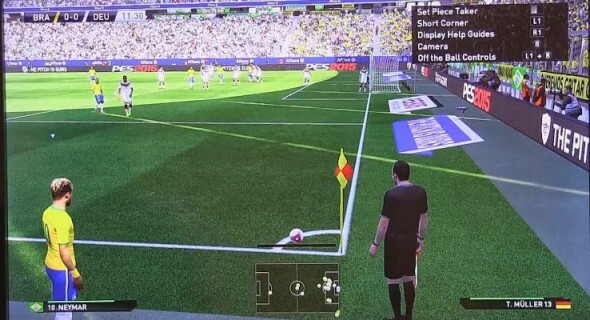 The most recent PES seems to make a comeback, with a more strategically and challenging type of football compared to the more action packed Fifa games. The AI in this newest installment is certainly something that you’ll need to pay attention to, as it is very well done and offers the players tons of challenges to overcome. If you dare to underestimate the AI because they are usually not that great, you’ll be in for a bad time. You’ll have to do more than just rush past your enemies, because they are strategically developed and will take your ball control any time you’re not paying attention. Once you have lost ball control, you’ll need to be prepare yourself strategically and position yourself well in order to take the ball back as they tend to get past you with passing the ball to other members. This requires you to swiftly change to another player. As a player, you have the option to choose between different modes like playing versus the computer or against your friends either locally or through the internet. You’ll be able to play in many types of competitions, like the UEFA Champions League, UEFA Europe League, AFC Champions League and the Copa Libertadores. Aside from these normal games that you can do at anytime, you’ll also have the special myClub function. In this mode you’ll be able to put together your own team and challenge other teams all over the world. You’ll choose which trainer you want each with their own management level and team formation. Next up you’ll need to choose which players you want in your team, which are from any country that is available but your whole team will be full of players that are from the country that you selected. Once you have made and registered you team, you’ll play in all kinds of matches and competitions. Once you have enough GP (which you earn by playing), you’ll be able to attract attention from all the best players and trainers of the world. You’ll have the option to sign contracts with different players, while being assisted by an agent that has a certain succeed probability for recruiting the player. The player recruited is done by a roulette, so you don’t have real control of who you recruit, which is kind of sad. You’ll get new agents by playing matches, and if you want a famous player in your team you’ll need to assign multiple agents to help you. When you recruit a new player, you’ll not be able to add them to your team instantly. You’ll first need to register them as member of your team by setting up your team in the “Team Management”. Here you’ll be able to choose your different tactics. When your team is complete, you’ll be able to use it in matches. Another mode where you’ll probably invest quite a lot of time in is the Master Competition mode. Here, you’ll act as a trainer trying to complete your personal goal. 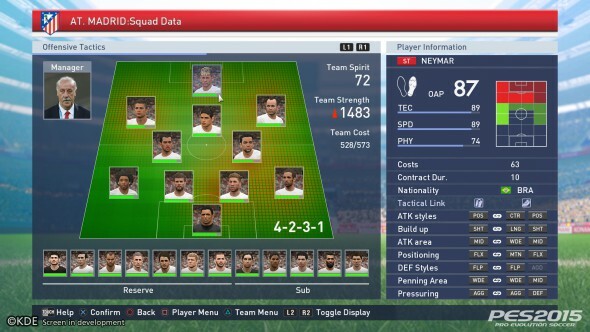 Instead of making your own team like in the myClub mode, you’ll only manage other teams to their glory. You aren’t fixed to one single team, instead you can switch between different teams or even to the national team of your choice. As the trainer of a certain club, you have the job to help your team develop their strength or transferring players from or to you own club. Time in this mode can be skipped, so you don’t have to make decisions every day. When you find a match you can either choose to play yourself, skip it or through assist mode where players will do their own thing while you’ll be able to give commands much like normal matches. Next up is the Become a Legend mode, where you’ll play as either an existing player from any club or make your own unique player that you’ll develop along the way. This mode is pretty similar to the Master Competition mode, but from the perspective of a player yourself. Aside from these essential modes where you’ll put most of your time in, you’ll also be able to check replays or statistics or training. Overall, the game does its job really well, certainly being a recommended game for those that like football in general and are used to playing them. The focus on strategy and skill in comparison with fast-paced action full of tricks and the smart AI is very appealing. However, while the game is very good, it is a type of game that is only fun for those that actually like the genre, so if you do not like football that much, then you probably wouldn’t want to play this newest installment in the PES games. But if you do like it, then I most definitely recommend it to try out.